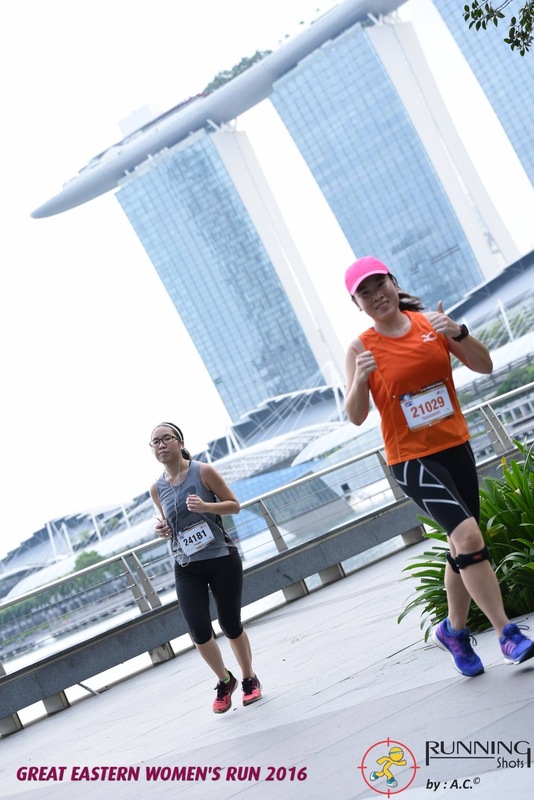 I started on my more serious running habit after joining the Great Eastern Women’s Run (GEWR) last year. One year later, I’m challenging GEWR again, this time doing the 21.1KM. One of the things I like about GEWR is the race pack. Last year’s was super awesome with lots of goodies. Loved the big bag that I used often for gym. This year’s bag was much smaller, it’s still filled with goodies but it won’t fit all my gym stuff. The race starts at 5.15am, and I reached early at 4.25am. There was a small crowd there, and I went to queue for the portable loos. The toilets were not lit and they were still locked at 4.30am. 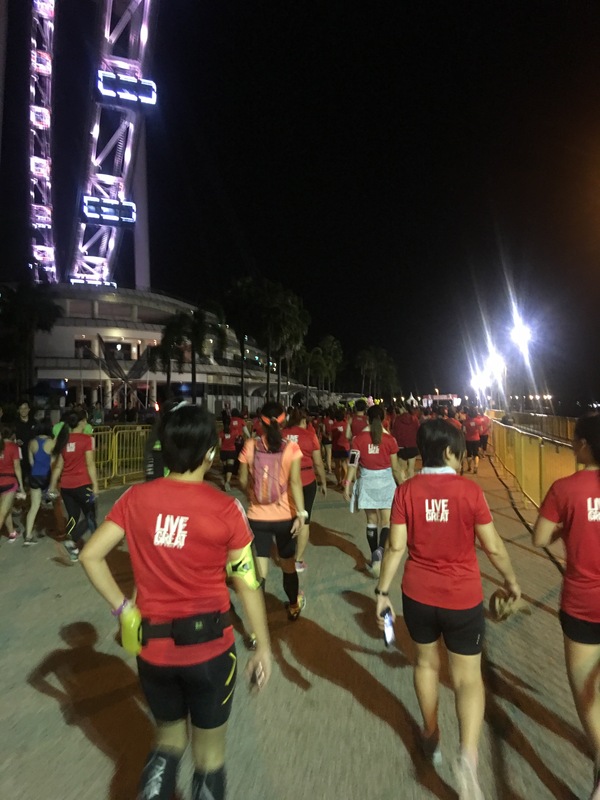 The crew was opening them in the dark and some of the runners look dismayed. I slowly proceded to the starting pen. Think it opened at 4.50am and I secured a spot in the first wave. There were DJs to warm the crowd, and unlike last year, there was no led warmup. I did my own warmup and soon at 5.15am, the elite runners were flagged off. We were flagged off at 5.20am. I had no confidence of running a smooth race this time. 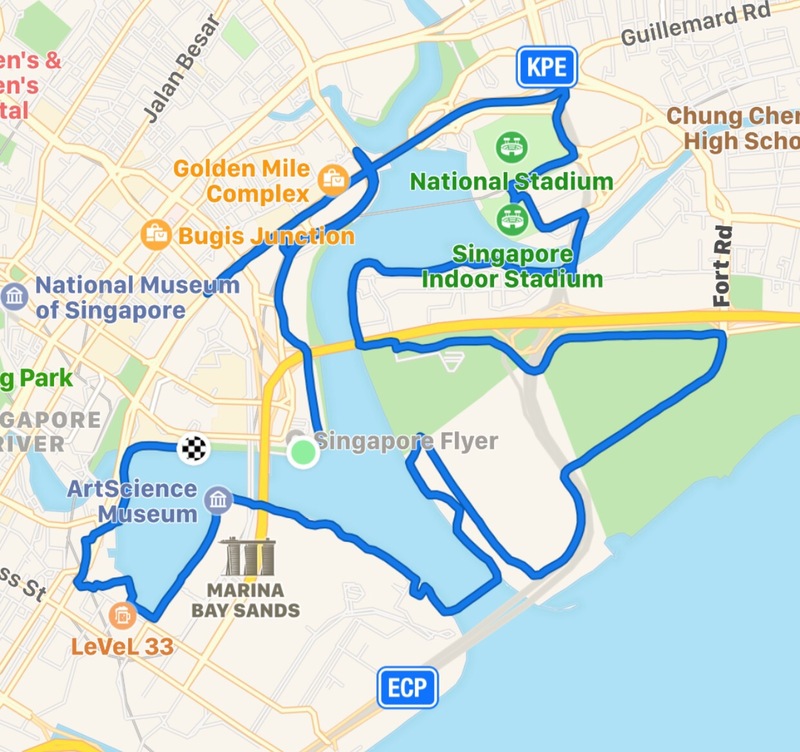 I envisioned myself running at 7.6km/h-8km/h and stopping to walk at certain points of the race if my knees can’t take it. I started slow, running at 7.17min/km. The weather was cooling since it rained heavily the day before. As the race started at 5.15am, some portions of the race route were rather dark. I ran with the 2:45h pacers till the 3rd KM and overtook them when I felt good about upping the pace slightly. I took my first sip of cool 100plus at the 4+KM and took the mineral water at the 3rd water point. I noticed that the hydration point that only has mineral water is much smaller. I think it was 2 tables big and it does not have many cups ready on the table. It managed to handle the crowd of runners when I was there, but I don’t know if it can handle the crowd behind me. Running on, we reached the Tanjong Rhu area, the area that has an inherent narrow path. What I like about this race was that it had signboards warning runners of narrow paths ahead. It made us mentally prepared and more alert. There was a hydration point with bananas at the marina golf area about halfway into the race. I didn’t see many people taking the bananas even though there had plenty and I only took water myself. At this point I still felt good, keeping to my pace of 7:13km/h which boosted my confidence of finishing this at a good pace. 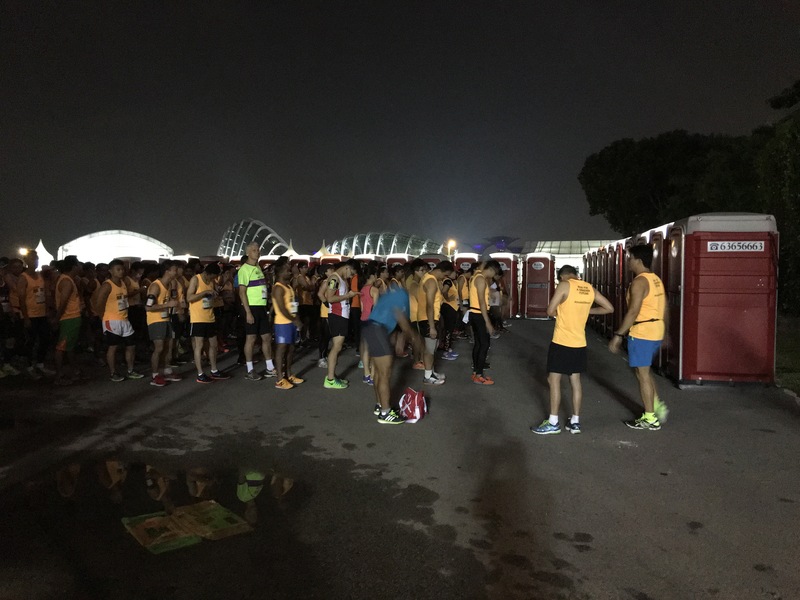 We merged with the 10km runners at the straights of Gardens By The Bay East. Everyone was still running so there was no held up here. We seperated from them at MBS, with only 3+KM left for me. I was really happy at this point; still keeping to my pace and feeling good, with cooling wind blowing occasionally. There were many photographers here, and I thanked them after they took my shot. Soon the finish was in sight at the floating platform and I picked up the pace slightly to finish in 2:32h. 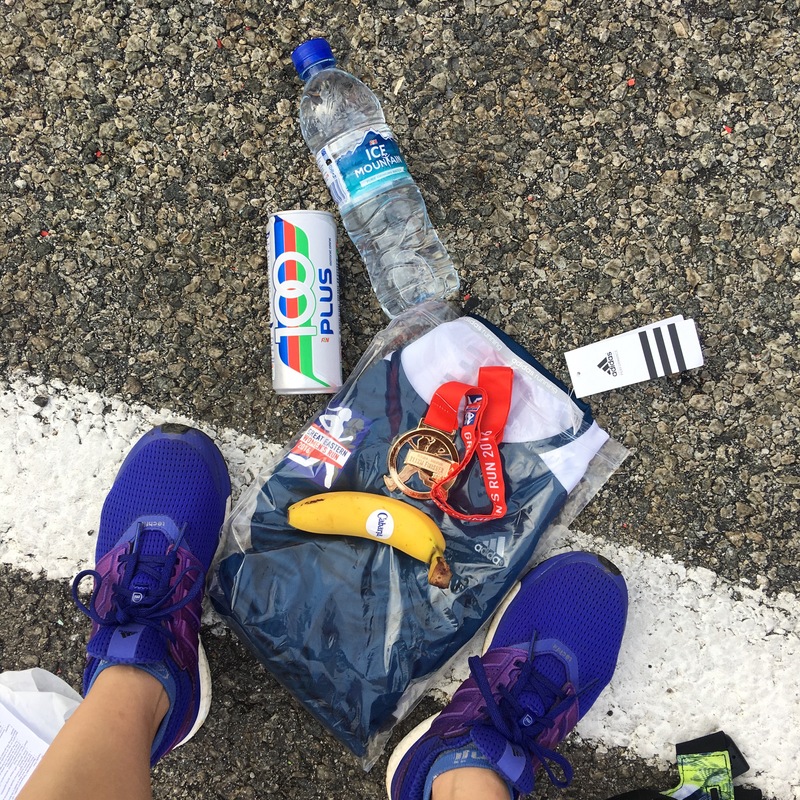 We were seperated according to tee shirt size to collect the medal, finisher tee, 100 plus, mineral water and banana. The post race fun fair zone was awesome. 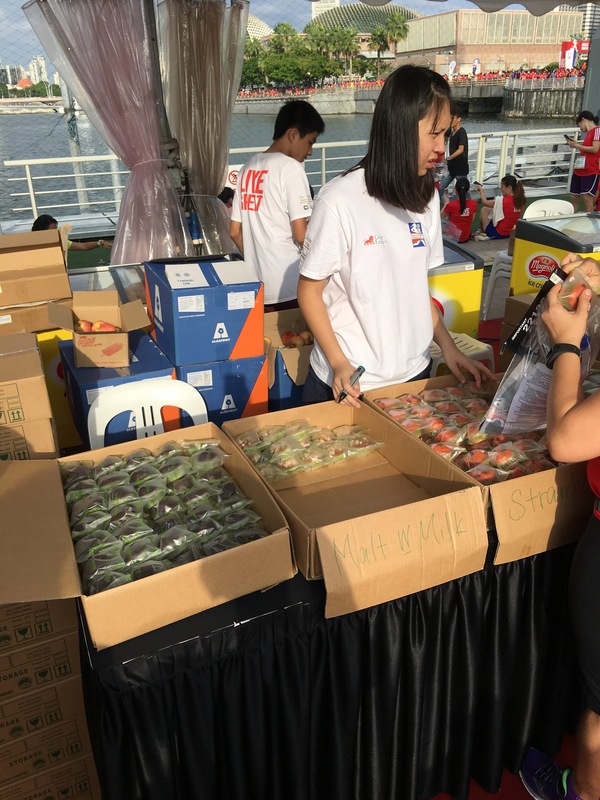 There was a snack area for runners to get ice cream, apples, polar cupcakes, yogurt etc. 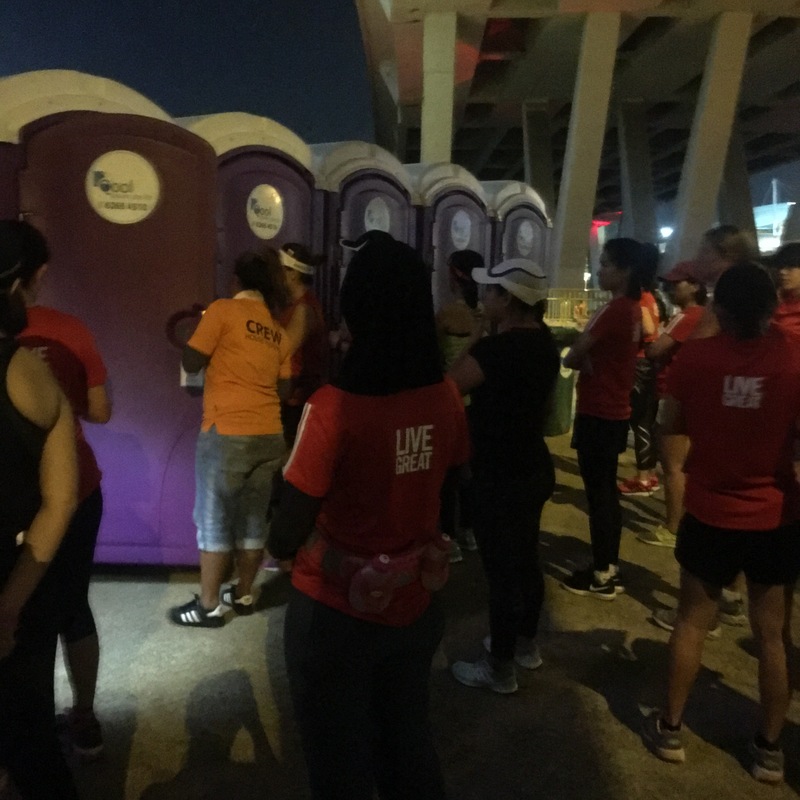 There was the massage area with a long queue and a refreshment area for us ladies to freshen up after the race. I got my ice cream and left happily! Most of the race route was wide despite some narrow paths. Luckily, there were signs to warn runners of the the narrow paths ahead so nice touch there. The hydration points were very adequate (8 of them altogether?) and the volunteers didn’t look overwhelmed at the task. In fact many held out the drink to runners! Awesome. There were some volunteers stationed in pairs at various parts of the race to guide and cheer runners on. Some were really enthusiastic, some not so much. The post run carnival was a highlight. Seldom does a race comes with a carnival so awesome. It is orientated towards ladies and comes with a zone to freshen up. Lots of free food available to hungry runners like me. Hydration zone and massage zone was also available. There was some activity at the main stage too. This race is heavily discounted for Great Eastern policy holders like me so I’ll definitely join this again next year. Till then! My GE Women’s Run result is out and I think I did pretty good with this race. Even though I wanted to complete it in 60mins but I think the time of 1:05:33 is still awesome. All the training prior to the race paid off. 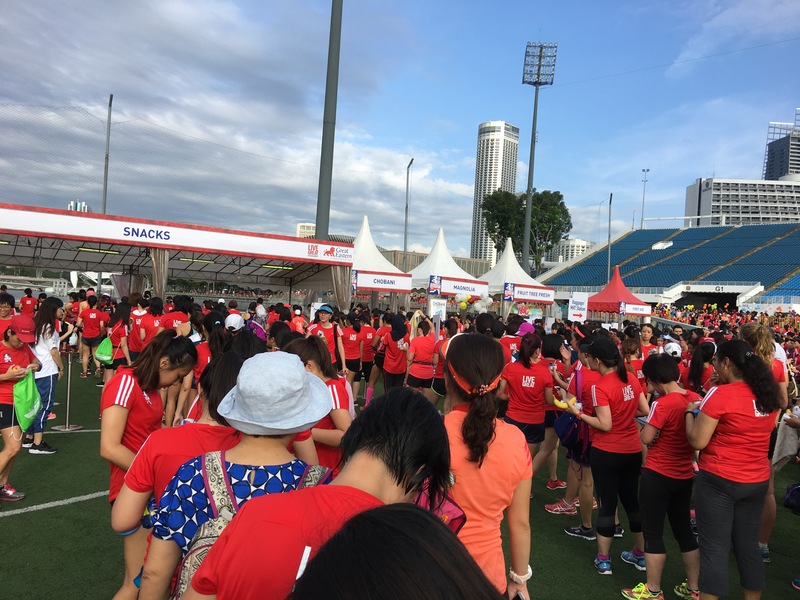 And… running can be addicting so I joined the Standard Chartered Run!